How do writers represent cognition, and what can these representations tell us about how our own minds work? 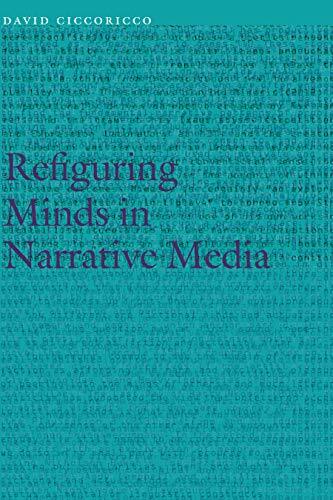 Refiguring Minds in Narrative Media is the first single-author book to explore these questions across media, moving from analyses of literary narratives in print to those found where so much cultural and artistic production occurs today: computer screens. Expanding the domain of literary studies from a focus on representations to the kind of simulations that characterize narratives in digital media, such as those found in interactive, web-based digital fictions and story-driven video games, David Ciccoricco draws on new research in the cognitive sciences to illustrate how the cybernetic and ludic qualities characterizing narratives in new literary media have significant implications for how we understand the workings of actual minds in an increasingly media-saturated culture. Amid continued concern about the impact of digital media on the minds of readers and players today, and the alarming philosophical questions generated by the communion of minds and machines, Ciccoricco provides detailed examples illustrating how stories in virtually any medium can still nourish creative imagination and cultivate critical—and ethical—reflection. Contributing new insights on attention, perception, memory, and emotion, Refiguring Minds in Narrative Media is a book at the forefront of a new wave of media-conscious cognitive literary studies.